Fire. That’s what we saw when the feast of St. Michael the Archangel arrived on November 21, 2012: fire. It destroyed the walls, floor, and ceiling of the servers’ room, ate its way up into the rafters, dropped the chandelier, and worked its way through everything along the apex of the ceiling except for the icon of St. Michael. The icons written by the Ukrainian masters, Petro Cholody (Junior) and Mykhailo Osinchuk were heavily damaged; smoke and water had ruined our service books and Bibles; and everything from our vestments to the altar to the majority of the church furniture was destroyed or unrecoverable. Standing there after the smoke had cleared, seeing everything so blackened and caked with grime, stinking of chemicals and fire… it was heartbreaking. 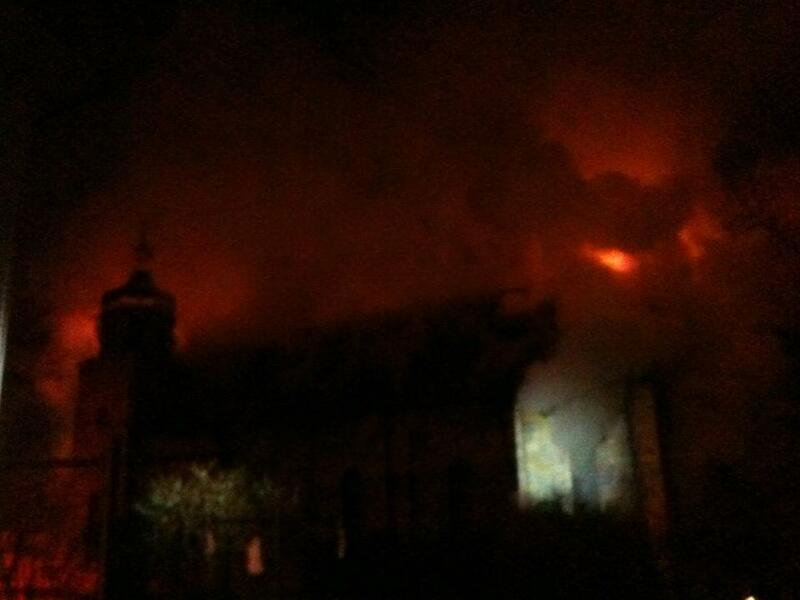 Smoke and fire obscure the view of the church as it burns in the pre-dawn hours of Michaelmass, 2012. 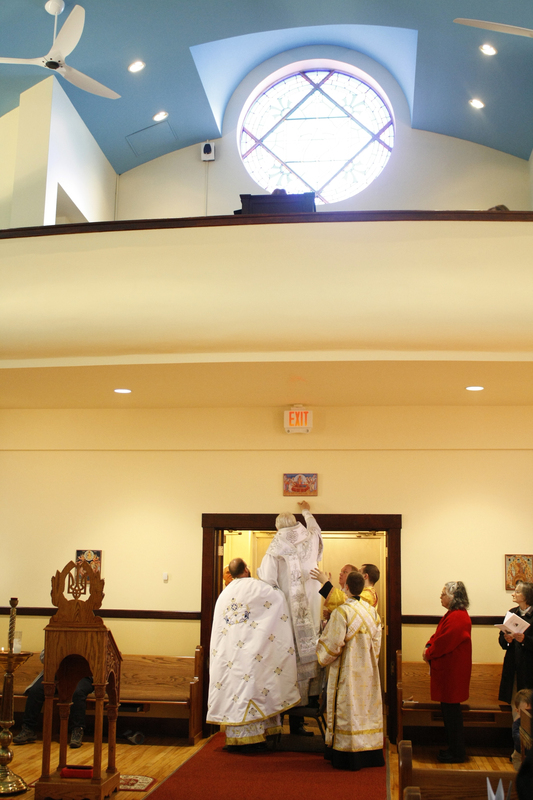 This parish had lost its first building in a lawsuit, so this building, constructed during the war when labor and supplies were in short supply, was venerated with tremendous reverence. This tragedy could have torn us apart. It didn’t. The insurance settlement process was long and arduous, full of uncertainty and rumors. That could have torn us apart. It didn’t. We finally received a settlement; we wondered whether it would be enough to renovate, whether we should tear down the ruins and build something new, we wondered whether we should build somewhere else…. These options, loaded as they were with diverse opinions, could have torn us apart. They didn’t. The long rebuilding process required many practical decisions, any one of which could have torn us apart. They didn’t. For two years and several months, we worshipped in our hall, with the altar on a stage and all of us packed in like sardines. Our choir, used to wonderful acoustics and the comfort of a choir loft, made due with the back corner. Our people, used to the beautiful architecture, iconography, and pews of the church, made due with much less. And yet we didn’t just endure our exile in the hall; we thrived. We loved being cheek to jowl as we praised our risen Lord, to make sacrifices for one another, and to welcome guests. It was a beautiful thing to be a part of. Our parish leaders sacrificed the most; the many, many, meetings and time spent trying to master new processes and make vital decisions; the temptations to pursue personal desires over unity, to manipulate opinion rather than seek genuine conciliarity (sobornopravnist), and to give into blame, judgmentalism, and despair. And yet we didn’t. We learned new spiritual disciplines and renewed our commitment to Christian (rather than worldly) leadership. It was a beautiful thing to be a part of. 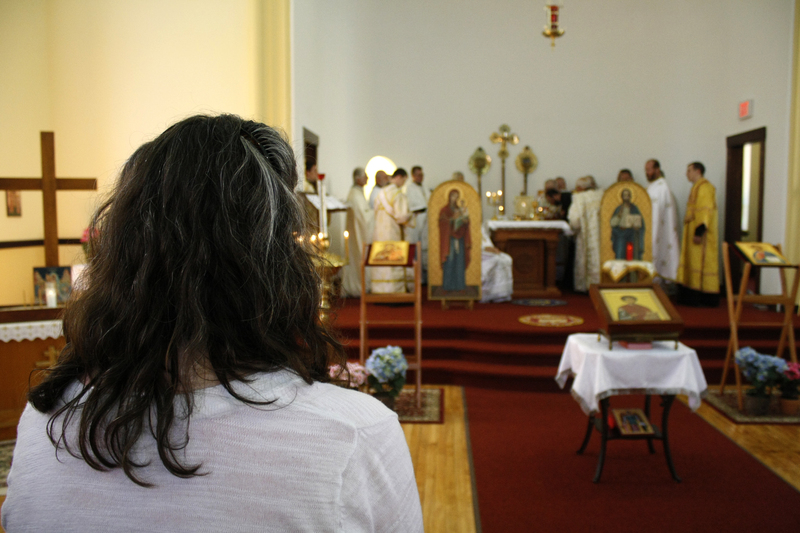 In the hall with Vladyka Antony after a Presanctified Liturgy in 2013. We were finally able to start worshipping in the rebuilt church on Nativity. This past Saturday (4/25), we were able to consummate our return with the ancient service of the Consecration of the Altar and Church. On the eve of this event, His Eminence, Metropolitan Antony and seminarians Ivan, Volodya, and Yuri braved the six and a half hour drive to Woonsocket. 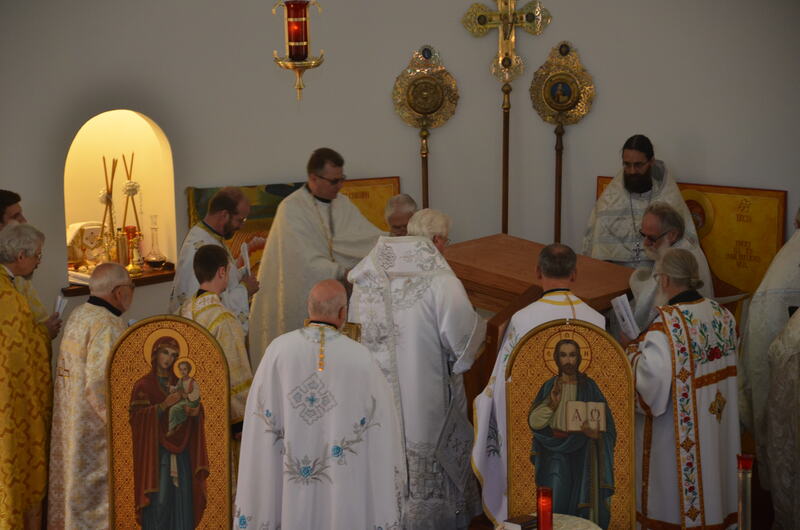 Vladyka Antony solemnly delivered the relics of the Martyr and Unmercenary Healer Panteleimon, into the church. He had seen first-hand the damage that the fire had done and was overwhelmed by the beauty and intimacy of the church. Amidst the wonder and joy of seeing the church rebuilt, there was confusion: he couldn’t help but notice that something was missing. Our liturgical woodcarver, Fr. 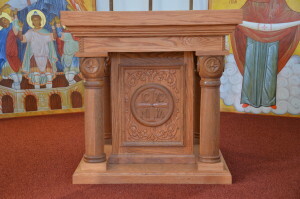 Onisie Morar (St. John’s Romanian Orthodox Church, Woonsocket RI) had spent months reclaiming wood from our old pews to construct the altar table, spending sleepless night after sleepless night for weeks getting it ready, but the Metropolitan was here and the altar table was not! After we finished chanting our prayers and hymns, Fr. Onisie arrived with a huge (but exhausted) smile on his face; the altar table was here and it was beautiful! We put it into place, marveled over its craftsmanship, and prepared it for the next day’s service. We all went to bed anticipating the glorious day that was to come. Fr. 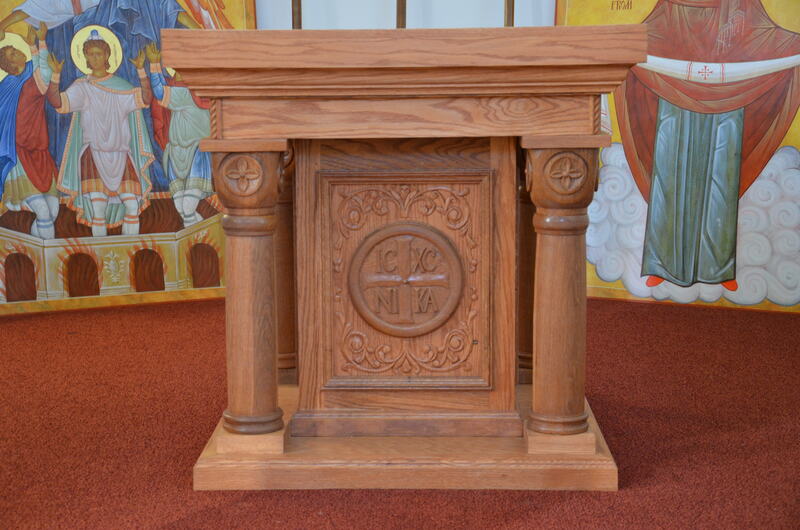 Onisie Morar, a dear friend of the parish, built and carved the new altar from wood re salvaged from our old, damaged, pews. Saturday morning arrived with all the beauty of springtime in New England. Vladyka Antony processed to the church as our choir, the long-time jewel of our parish, sang “From the Rising of the Sun.” Betsy Abrahamson, our Jr UOL President, greeted him with flowers, and our parish president, Dan Bourgery, greeted him with bread and salt and a report on the state of the parish: exhausted but overjoyed! 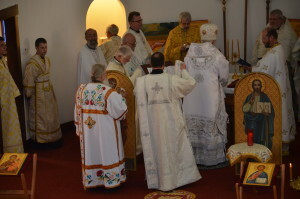 I greeted Vladyka Anthony by describing how the parish had grown over the last few years, and how we were, for the third time in four years, offering up one of our own for ordination. 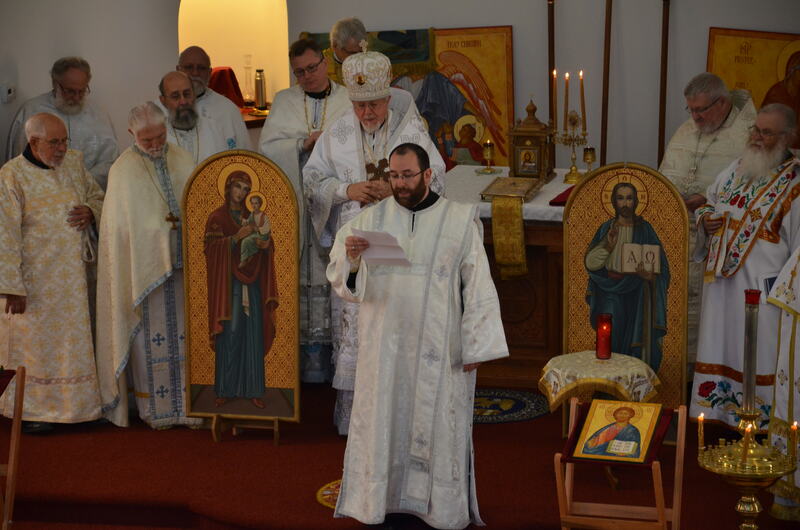 Vladyka Anthony expressed his joy at witnessing this growth and being here to ordain Subdeacon Michael and consecrate the church. 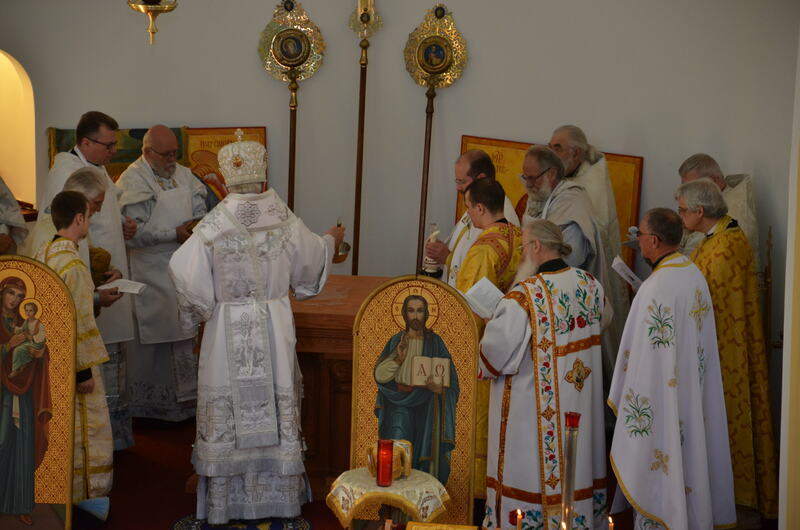 He blessed each of the concelebrating priests and deacons; Fr. Anthony, Fr. 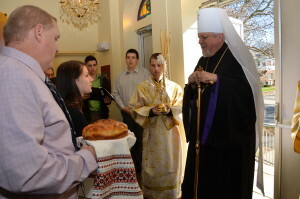 Steven Masliuk (St. Mary’s parish in Bridgeport, CT and Dean of New England), Fr. Onisie, Fr. 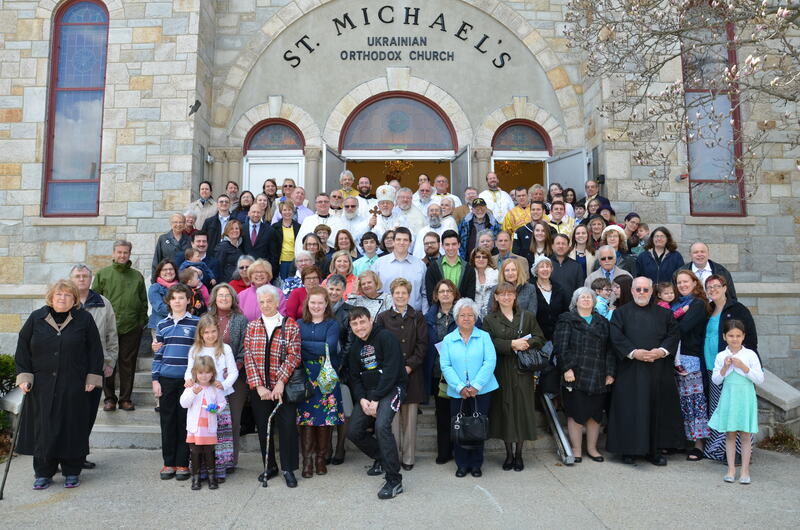 Roman Tarnavski (St. Andrew’s parish, Boston), Fr. 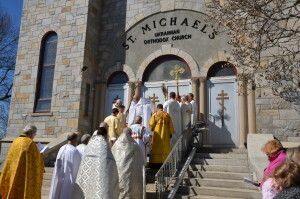 Myron Oryhon (St. Mary’s parish in Allentown; a former pastor of St. Michael’s), Fr. John Bacon (OCA, Retired), Fr. 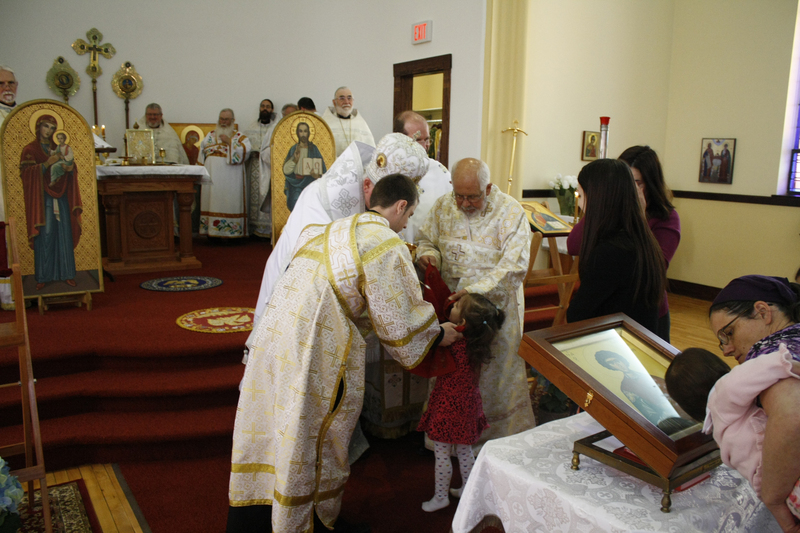 Vladimir Aleandro (Christ the Savior OCA parish in Southbury, CT), Fr. Mark Sherman (OCA, Retired), Fr. 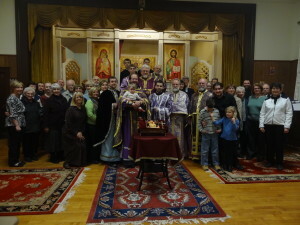 Andriy Pokotylo (St. Mary’s parish in New Britain, CT), Fr. 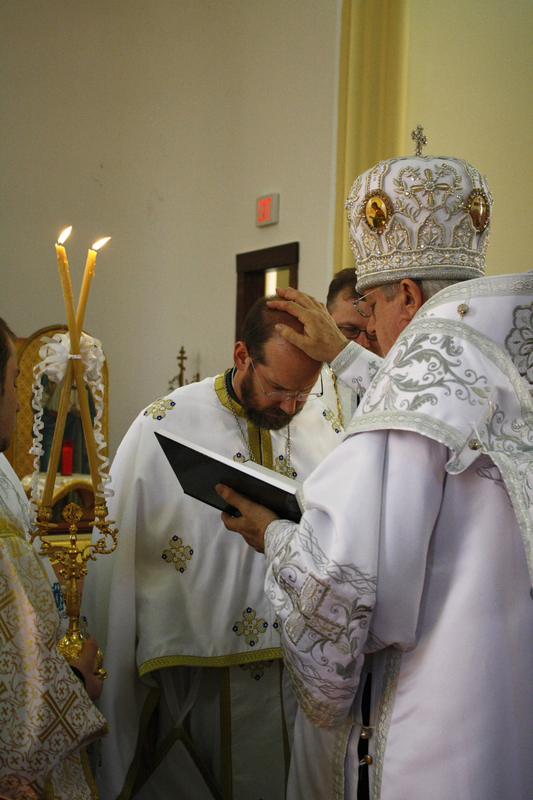 Kevin Kalish (New Martyrs ROCOR parish in Norwich, CT), Fr. 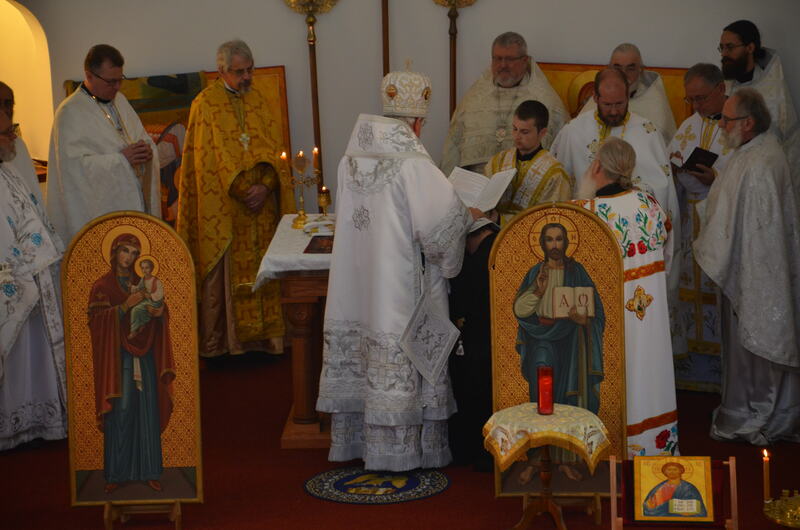 David Kinghorn (St. Cuthbert’s Western Rite ROCOR parish in Pawtucket, RI), Hierodeacon Vasyl (St. Michael’s parish in Woonsocket, RI), and Dn. Paul Cherkas (St. Michael’s parish in Woonsocket, RI). The concelebrating priests and deacons greet His Eminence. After the bishop had been vested, all of the clergy and server-seminarians went into the altar, and the consecration service began. It was a majestic and moving service, full of beautiful prayers and sung psalms and hymns. The first major ritual action was the anointing of the altar with holy water, wine, and rose water. 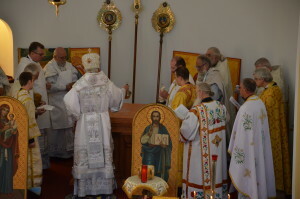 Metropolitan Antony anoints the new altar. Next was the procession, when the Metropolitan took the holy relics of St. Panteleimon from the table in front of the (temporary) iconostas and was joined by the clergy, choir, and people in a joyous celebratory parade around the church. Metropolitan holding the relics of the Martyr and Unmercenary Healer Pantelaimon. Fr. Myron Oryhon, former pastor of St. Michael’s, leads the procession, blessing the walls. At the front doors, the choir went inside, the doors were closed, the relics were placed on a table before the doors, and a wonderful dialogue was carried out between the Metropolitan and the choir (“WHO IS THE KING OF GLORY!”), at the end of which Vladyka Antony blessed the doors with the relics and led us all back into the church as he took to relics into the altar for encasement within the altar table. The relics are placed on a table before the doors. The relics were sealed in a small chest which was then itself sealed into the central column with wax mastic, a blend of beeswax (purified at the parish from prayer stubs), resins, incense, marble powder (chipped and scraped from the church exterior), and rose oil (brought back from the Holy Land pilgrimage). The top was then sealed to the columns and the entire altar table was anointed with wine, holy water, rose water, and Holy Chrism. After the relics have been placed and sealed in the central column, Fr. Oniesie directs the placing of the altar top. Once this was accomplished, the Metropolitan concluded the service by anointing and asperging the walls of the church. 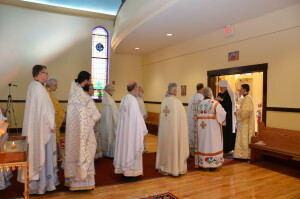 Metropolitan Antony anoints the western wall of the nave. Sdn Ivan assists Mp Antony as he blesses the church. 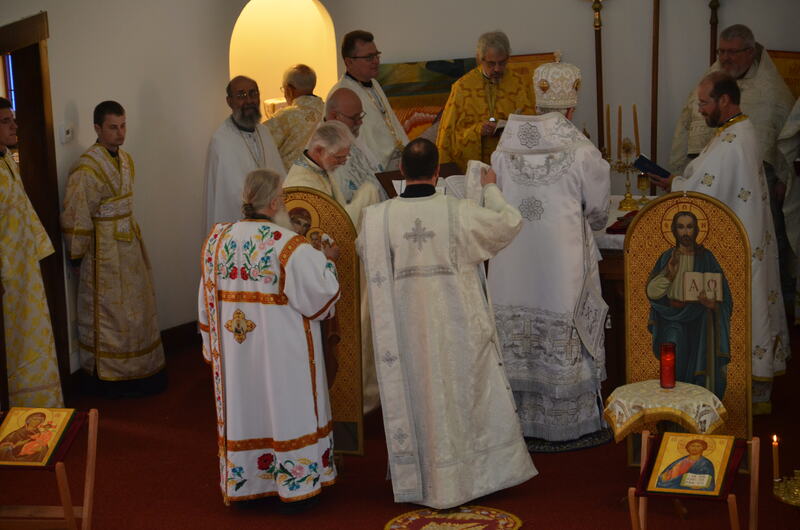 We then transitioned into the Hierarchical Divine Liturgy. This was when the parish choir and deacons really shined; it was so beautiful! 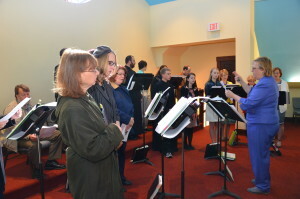 Donna Eichorn directs the choir. During the Entrance with the Gospel, Metropolitan Antony surprised the entire parish (and me) by awarding me the gold cross for my pastoral efforts in guiding the parish through the grieving and rebuilding processes. 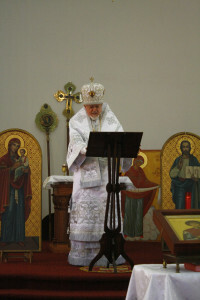 Metropolitan Antony awarding Fr. Anthony the gold cross and the title “Protoyerey” (archpriest) and honorific “Very Reverend”. 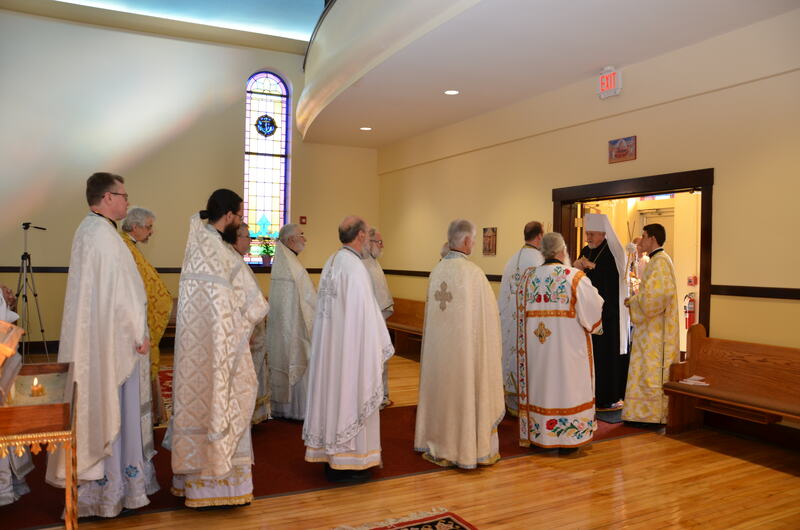 After the anaphora, Seminarians Ivan and Volodya led Subdeacon Michael to the Holy Doors and handed him off to Heirodeacon Vasyl and Deacon Paul. Seminarians Ivan and Volodya lead Sdn Michael to the Holy Doors where Deacon Paul and Heirodeacon Vasyl greet him and bring him in. Deacons Paul and Vasyl lead Sdn. Michael around the altar. Faith Abrahamson watches here husband Michael being led around the altar. 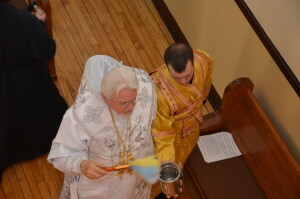 Vladyka Antony lays his hands on Deacon Michael. 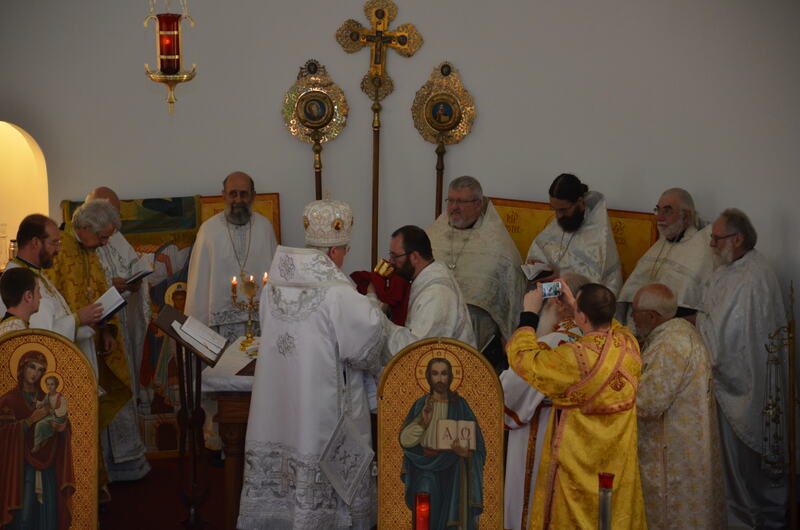 Metropolitan Antony vests Deacon Michael – AXIOS! The next major action was Communion. It is always so moving to see a full church and everyone coming forward to receive the deifying Gifts from the hands of their archpastor! Valdyka Antony communes the newly ordained Deacon Michael at the newly consecrated altar. Vladyka Antony communes the faithful. Next, Vladyka Antony offered wonderful heartfelt words that reflected on the tragedy of the fire, the joy of seeing the church not just whole but more intimate., and how good it was to consecrate the altar to the glory of God. He was moved to share the wonder of being in a place where heaven and earth meet, where the broken receive healing, where the Gospel would be shared for generations to come, and where the doors of salvation would be open to everyone. He thanked the choir, his concelebrants, and the people, and challenged everyone to make the Lenten Prayer of St. Ephraim a part of their daily prayer rule throughout the year. 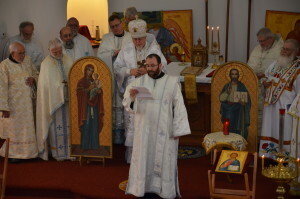 Vladyka offers congratulations us and challenges us to share the Gospel. Deacon Michael then thanked everyone, and especially his wife and family, for all their love and support. Deacon Michael remembers his mentors and thanks everyone. Valdyka and his concelebrating priests, deacons, subdeacons, and server. After the service, in front of the newly consecrated church. After the service (and pictures), we reconvened at the banquet hall of Coachman’s Lodge for more fellowship and family style chicken (a Rhode Island staple). At the end of the banquet, Janice Meschisen, Second Vice President of the UOL National Board, presented a wonderful letter of congratulations from Mickey Komichak, the UOL National Board President, and the entire UOL National Board. Fr. 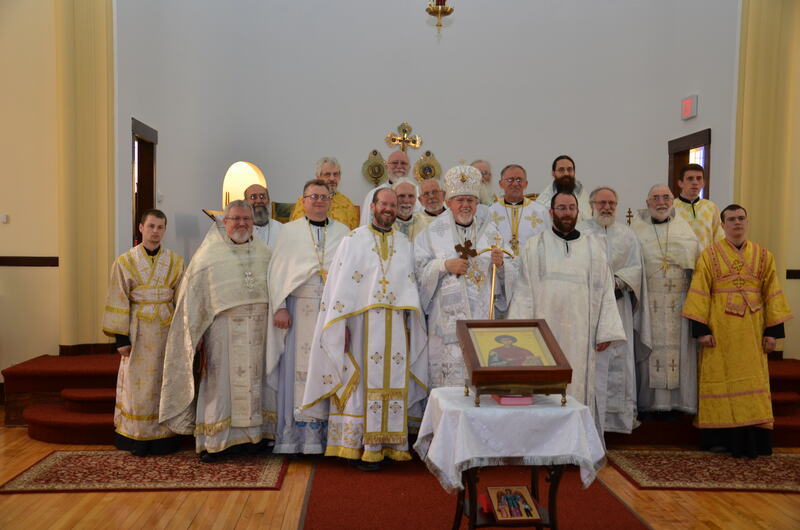 Anthony spoke on the parish’s response to the tragedy of the fire as an icon of the Ukrainian Orthodox of conciliarity (sobornopravnist), with bishop, priest, parish leadership, and laity working cooperatively towards the glory of God. As a token of his thanks, he called the choir director, Donna Eichorn, the President of the UOL, Erika Namaka, the President of the Jr. UOL, Betsy Abraham, and all the members of the parish board forward and presented them with a unique gift in token of his appreciation for their many sacrifices: slate preserved from the damaged church with the image and tropar of St. Michael the Archangel engraved on them. Fr. 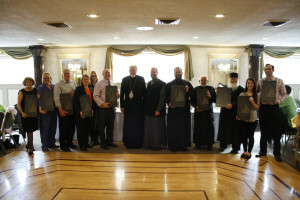 Anthony presented the parish leaders with St. Michael slates. Metropolitan Antony again blessed the parish, noted its accomplishments, and challenged all of us to protect our children and youth (and ourselves) from the atomizing influence of the internet and ensure that the Church is the foundation of their life. 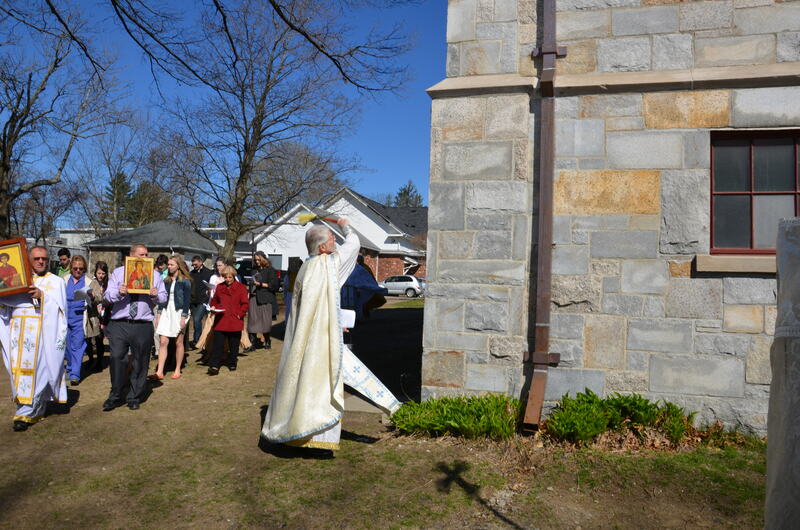 The event ended with hugs, tears of joy, and many iterations of “Many years” and “Christ is Risen”.